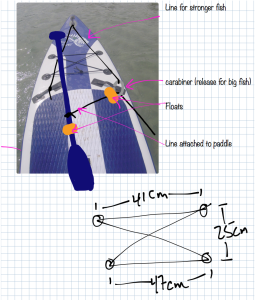 All week I have spend my evenings sketching ideas and furtively googling “fishing SUP” and perusing the links. While I found a lot of avid fishermen out there on SUPs, which led to sketches like the one above, I just did not think that was what I was looking for. Most of these people seemed to be fishermen first, and paddlers second. I, on the other hand, find myself leaning the other way. As such, I was really interested when I found a few posts about an avid paddler who just happens to drag a trolling line behind her. This seemed much more my speed. 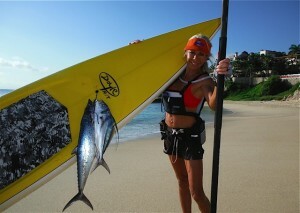 Here is a gal who goes out with barely more than a line, and brings back some impressive fish. Reading up on her set-up had me reworking my plans. She actually ties her line off to her paddle, which somehow does not get in the way of paddling, and just tosses it aside when she gets a hit. She then pulls in the line hand-over-hand. To get this to work for me, I mocked up the image on the left. The idea was to connect the line to the paddle near the handle, and run it through a carabiner connected to the side carry handle. This way a strong hit would pull forward, rather than back, so I would be more likely to land on the board if I hit sent me reeling. Also, I added a float to the paddle, and another by the carabiner to keep from damaging the paddle if it were pulled up tight. Additionally, I started wondering what would happen if I hooked a ヒラマサ (Yellowtail Amberjack) rather than a ワカナ (Japanese Amberjack) as planned. 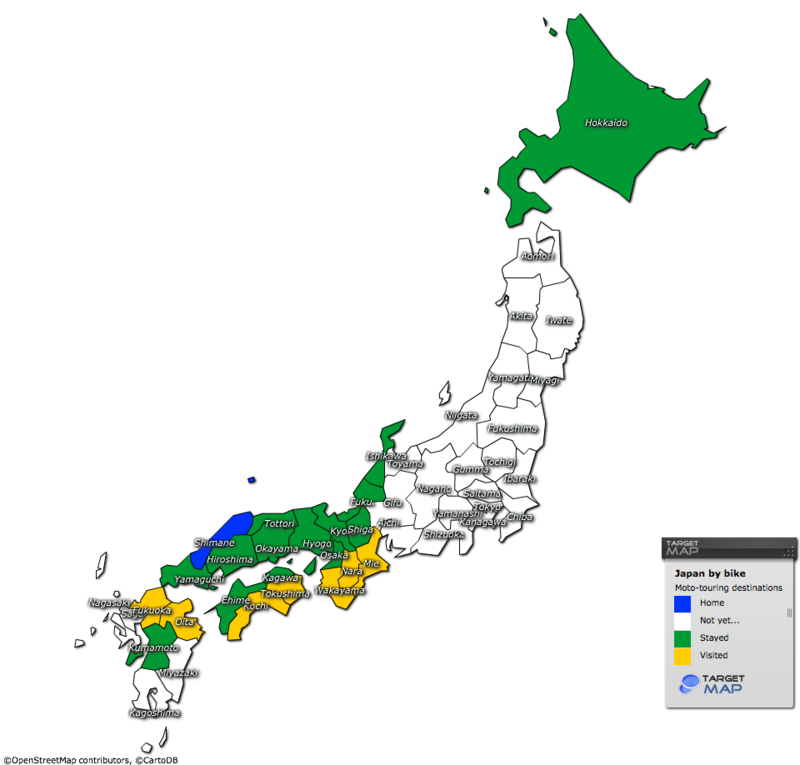 While ワカナ, which the name for a juvenile of the species, are about 30 to 40 cm, ヒラマサ run a meter or larger. They are both also known as ‘fighting fish’, so they pull. So, I decided that I just may have to rig things so that I can run the line through the bow loop if a larger fish starts to drag me. As my SUP only has a 30 inch beam, I don’t think things will go to well if a strong fish starts pulling perpendicular to the board. 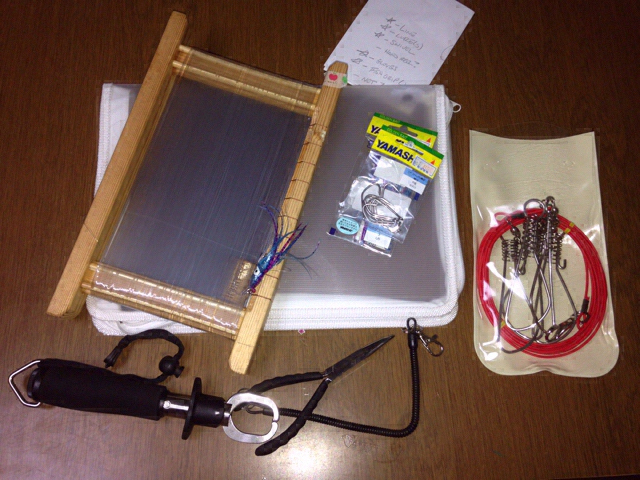 Simplified kit, complete with a 100 yen zipping folder to carry it all.